Telangana Employees Health Scheme: Employees Health Scheme is intended to provide cashless treatment to all the State Government employees including the State Government pensioners, along with their dependent family members through a network of empanelled hospitals of Aarogyasri Health Care Trust." The Government of Telangana State has announced a Diwali Festival Bonanza for all the state Government employees. The government will provide free treatment for all health issues without any ceiling on the expenditure and without any contribution from the employees. Now onwards, there is no need for any employee to pay a single paise that means in case he suffers health problems. The TS Government has decided to even pay the insurance share amount of an employee on behalf of Employee Health Scheme. The Govt is to issue Cash less Cards for them on behalf of Employees Health Scheme (EHS). The Telangana CM had lifted the maximum cash limit on hospital expenditure for employees. He formally accepted to provide 100 P.C. assistance for their treatment. Almost 4 Lakh regular employees and 2.43 Lakh retired employees are benefited by the decision made by the Government. In this regarding T Govt has issued health cards to employees on Diwali festival. Telangana Govt has launched the new health scheme for government employees on Wednesday. Teachers and Employees no need to pay any premium amount/Contribution from their Salary. Treatment of any disease in any Hospital( Government or Private). Health Cards also will be given to Aided Teachers Shortly. T Govt issued Model Health cards at secretariat on October 22nd, 2014. Then new webpage that is "The Telangana State Government Employees Health Scheme Official Web Site" will be opened in your browser. Then drop down menu will be opened. Then select the employees/ Pensiones and click on it. New webpage will be opened again in your browser. Then your particular web page will be opened like your name with employee type. 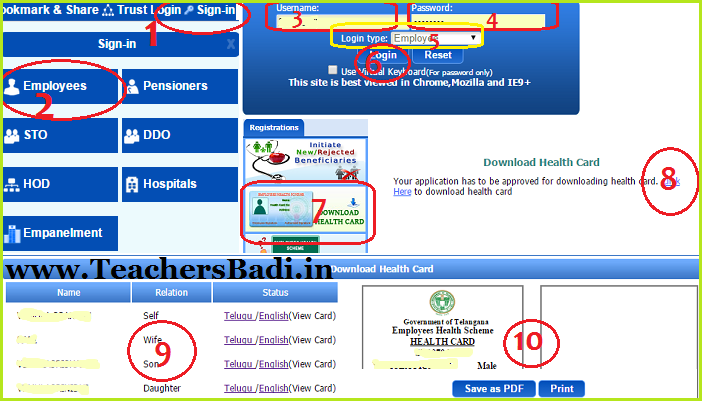 Then search for "DOWNLOAD HEALTH CARD" button in left side of web page and click on it. A Message will be appeared on your page like "Download Health Card Your application has to be approved for downloading health card. Click Here to download health card"
Then your health cards will be appeared and print your health cards that's all. Telangana EHF Website is providing facility to employees/pensioners for download Telangana State Permanent Health Cards and now downloading started. All the employees are requested to take Print out on or before October 31st, 2014 and Treatment Starts from November 1st,2014. For download health cards useful links are provided here. So, please use below given links in Our website. I have recently seen "teachersbadi.in" website. Really it contains all information about teachers, , Employees & Pensioners Health card, important G.Os etc. Recently, Telengana Govt. announced issue of permanent Health Card to all State Govt. employees and Pensioners. From your site, one can download the permanent Health Card. Some of my friends informed that the permanent Health Cards can not be used as the G,O. in this regard still to be issued. I, therefore, request you kindly to inform me whether G.O. is issued and one can seek treatment in any corporate Hospital or in a selected Hospitals at Hyderabad. Thank your for visit our TeachersBadi.In Website. We always provide useful information to teachers and also students. Health Cards More Details are available here, so you can click on the above mentioned more section link..
Namaste sir, This is P.Upender,Time scale employee working as a Technical works inspector, Panchayath raj department working since 1993.Please give health cards to time scale employees. Thanking your sir. Dear Sir, Health cards are not being accepted by corporate and private Hospitals, they should be brought in line of Govt. orders.Further We pensioners have first time gone 52 indefinite strike in 1969 to achieve Telengana, but our sacrifices have not been recognized and no telengana incentive was sanctioned to us. the Associations, Unions should represent the matter to Govt. and justice may be done to pensioners. These Health Cards are not being accepted by Corporate Hospitals in Hyderabad itself..in many hospital like KIMS ...etc .what is the use? Down load Card and Health Card. What does it mean? There is no health card down load information available in this. There is no Health card information available herein. Except boosting nothing remains there.Waste of time and energy.